The MA Show made my career. Taking part in the MA Show gave me an opportunity to showcase my designs from the MA in Menswear that ultimately led me to Hong Kong where I am now collaborating on various fashion projects, and it gave me a platform in London where it has always been my dream to study and work. I chose this course to enhance my design ability and broaden my horizons, and because it was taught by Darren Cabon who is a great teacher and allowed me to discover my potential. During the course my design ability improved in terms of research, creative thinking and technical problem solving. It's definitely crucial for designers. Sometimes you need someone to tell you what talent you have and the possibilities for using your skills. The MA show was the final opportunity to reveal my work after studying on the course and doing an internship with Alexander McQueen. London is the fashion capital of the world and the designers are really innovative, creative and daring. I learned to improve my technical ability in designing and tailoring menswear but also to strike a balance between the commercial and creative aspects of fashion. After the MA Show I entered an international fashion competition called Mittelmoda and won! 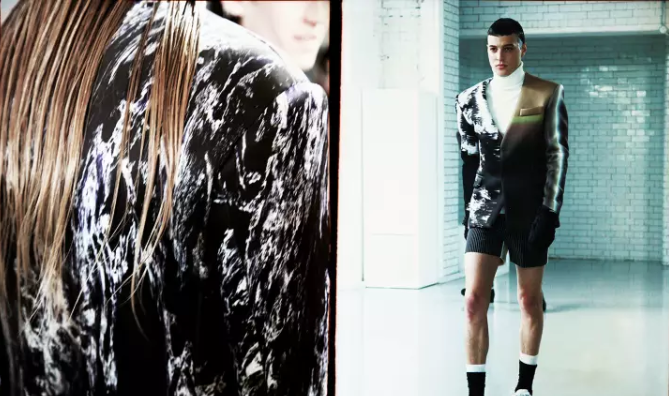 I was chosen to design a concert costume for the 2012 world tour of the band Muse, and then I was spotted by GQ China who sponsored my solo show at London Collections: Men in June 2013. I've just finished one fashion week project in Hong Kong and am now working on this year's fashion week, but I'd like to return to London soon for more collaborations. None of it would have been possible without great tutors and technicians at London College of Fashion. The course and the final show are essential for fashion designers seeking to develop their originality; especially those who would like to have their own brand.